Very few people enjoy wearing a wig or toupee; the hair is itchy and uncomfortable, and the adhesives can damage your scalp underneath. Up until recently, the only other realistic option was to undergo a hair transplant surgery, something which has long been popular in the celebrity sect. From John Travolta to Jude Law, James Nesbitt to Wayne Rooney, there is a whole lot of hair transplanting going on for those who have the cash to splash. However, now there is another option for those who might not want to invest so much time, money and stress levels in transplanting hair into their scalp, and that’s micropigmentation. This simple, non-surgical procedure is affordable for all of us, and offers a way to turn a balding head into a style statement with ease. Because it’s so hard to tell when it’s been done, few celebrities will own up to choose this over hair transplantation, but there is a growing list who have ‘come out’ about their hair tattooing habits. If you’re suffering with thinning hair, patchy baldness or complete hair loss, you might be wondering which procedure is better for you. Let’s check out the facts about both treatments, so you can start to make a more informed decision. Follicular unit transplantation (FUT): A strip of your scalp is removed from the back of your head. Individual grafts of one to two hairs are removed, and the inserted into the bald or thinning area through small incisions in your skin. Follicular unit extraction (FUE): Individual follicles and hairs are removed one by one from the back of your head. Each one is inserted into the bald area through incisions. Both ways involve the attention of a trained surgeon and a visit to a private hospital for the day. Aftercare is intensive, requiring the use of a saline spray several times a day, as well as medical head washes twice a day. Some surgeons will recommend staying away from infection prone areas, such as public transport, and will request you do not exercise for a couple of weeks to avoid any damage. 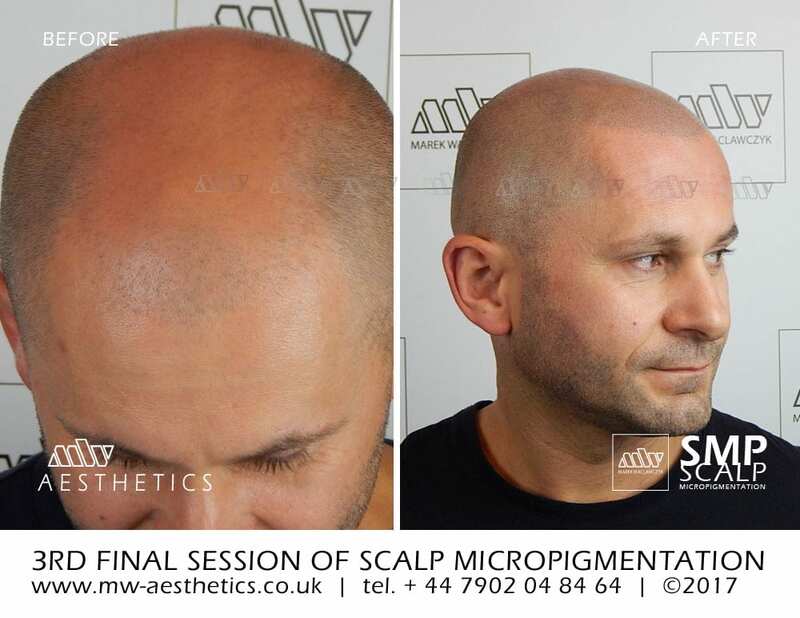 Scalp micropigmentation is a process whereby a small amount of pigment is placed within the hair follicles, making it appear as it you have a neatly shaven head. It is non-surgical and no anaesthetic is required. Unlike a traditional tattoo, the ink used contains no metals and is not permanent, meaning it looks totally natural, will not fade to blue and can be touched up annually to keep it looking good. WINNER: MICROPIGENTATION! The procedure for hair transplantation almost made us lose our lunch! Hair transplant surgery requires a full day in hospital. Depending on the size of the graft you are getting, you can expect the process to take from four to eight hours. You are not usually required to stay in hospital overnight, but will need someone to drive you home as the sedative will take up to 24 hours to wear off. The results take a lot longer to become apparent. Transplanted hair will fall out within 2 – 3 weeks, and new growth will usually be seen after 6 – 9 months. Within a year to 18 months the end result should be visible. With micropigmentation, each treatment will last around one to three hours, depending on how large an area you need covered. There is usually a gap of around one to four weeks between the initial treatment and the follow up treatment, which allows the pigment to set naturally into the skin. This means the practitioner will be able to see what the finished colour result will be, and to adjust the shades used to ensure a natural finish. Most clients require three appointments; some even need four. Once the treatment is complete, the colour lasts for up to two years, although you can come back within that time to have things touched up and cared for. There is no down time, no need to take more than the appointment duration off work, and because the follicles are built up naturally over time, even your closest friends will struggle to notice a big change. WINNER: MICROPIGENTATION! A day in hospital? A week off work? A year to 18 months before we see the results? Who has time for that?! During the procedure of having a hair transplant, you should not feel any pain at all. This is because you will have been numbed up by the surgeon, and given a sedative which will make you feel very sleepy. Following treatment, you are likely to have some pain for several days, and will usually be prescribed pain management medicine as well as antibiotics to reduce the likelihood of infection. You’ll need to wear bandages over your scalp for a few days, but should be able to return to work within 3 – 5 days following the surgery. People have their own threshold for pain, so for some scalp micropigmentation is more painful than for others. If you’ve ever had a traditional tattoo, let us assure you it is not as painful as that! This is because cosmetic tattoos only implant the pigment into the upper dermis of the skin. Traditional tattoos need to be implanted much deeper, meaning the needle is bigger, sharper, and goes further into your skin. Some clients liken the sensation of getting a hair tattoo to a scratchy sensation; others barely feel anything at all. We would be lying if we said there was no discomfort at all, but on a scale of one to ten, the pain is usually rated at around a three. After the treatment, the scalp may feel a little tender, but most people report no pain at all. WINNER: MICROPIGMENTATION! We’ll take an hour or two of scratching over a week of pain and medication any time, thank you. Is an adverse reaction likely? Itching is common after hair transplantation, but your surgeon will advise you not to scratch as it could damage the implant. Once the new hair starts to grow, you are likely to experience folliculitis, which is an inflammation or infection of the follicles. You may need antibiotics to tackle this problem. There is also a high risk of infection, both at the sites where the grafts were implanted, and at the donor site. All scalp micropigmentation techniques use natural pigments which have been chosen to be hypoallergenic. This means that there is little to no risk of an allergic or otherwise bad reaction to the treatment. Just to make sure, your practitioner will always perform a patch test prior to your first treatment, to ensure your body is happy with the pigments being used. WINNER: MICROPIGMENTATION! Hypoallergenic pigments and a non-permanent procedure which can be modified later on… it’s a winner! Hair transplant surgery should be a permanent solution. Once the new follicles are bedded in and growing, they should continue to grow just like any other hair. To give them the best chance of survival, you will likely be recommended to take medication for some time, and potentially sign up for regular laser hair stimulation therapy. However, it’s important to do your research as there is a relatively high failure rate with hair transplants; around one in ten or one in twenty is the figure we’ve seen from most clinics. We think hair micropigmentation looks amazing. Not only do you end up with a natural looking, clean shaven appearance, you can also reinvent your hairline to frame your face in the most attractive way. Our technician is incredibly talented, and works meticulously to replicate a natural scattering of follicles, adapting the colour and size of the individual pigments to replicate your own bespoke look. Scalp micropigmentation is also highly effective for those who are not bald, but are otherwise suffering with thinning or lost hair. It can be applied over scars, hiding areas where the hair no longer grows following trauma, and can be used to darken areas where the hair is thin, giving the appearance of thicker, fuller hair on top. WINNER: HAIR TRANSPLANTATION: It’s the only permanent solution to baldness and hair loss out there. The precise cost of your transplant surgery will depend on how much hair you need transplanted and where you go for treatment. The cheaper clinics in the UK cost around £5 per graft, and as a guideline you’d need anything from 1,000 – 7,000 grafts to treat a receding crown and hairline. Top clinics will charge as much as £30,000 to treat male pattern baldness, and with surgery this serious, you don’t want to start cutting corners by going to the cheapest one. 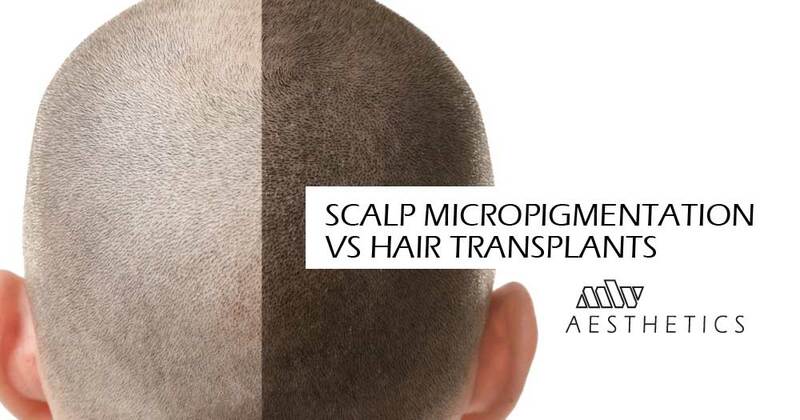 The costs of scalp micropigmentation in the UK will depend greatly on what you need done. Small patches of treatment, to cover scars or thinning areas, can cost from £800 – £1,500. Crown and hairline work can be from £1,000 upwards, and a full procedure will usually cost in the region of £2,000 – £3,500. The cost is reflective of the skills of your practitioner too, as well as the area in which you live. WINNER: MICROPIGMENTATION! Those sorts of figures are something we can all aspire to and save up for. Hair transplantation sounds like we’d need another mortgage. Our vote goes to micropigmentation every day, but then you’d expect that from us, right? It’s true that we are biased, but only because we’ve experienced first-hand the amazing results that are achievable with this simple, affordable procedure. We have even worked with some customers post-transplant surgery, to help them hide any remaining thin spots and create a more natural looking finish. Still not sure? 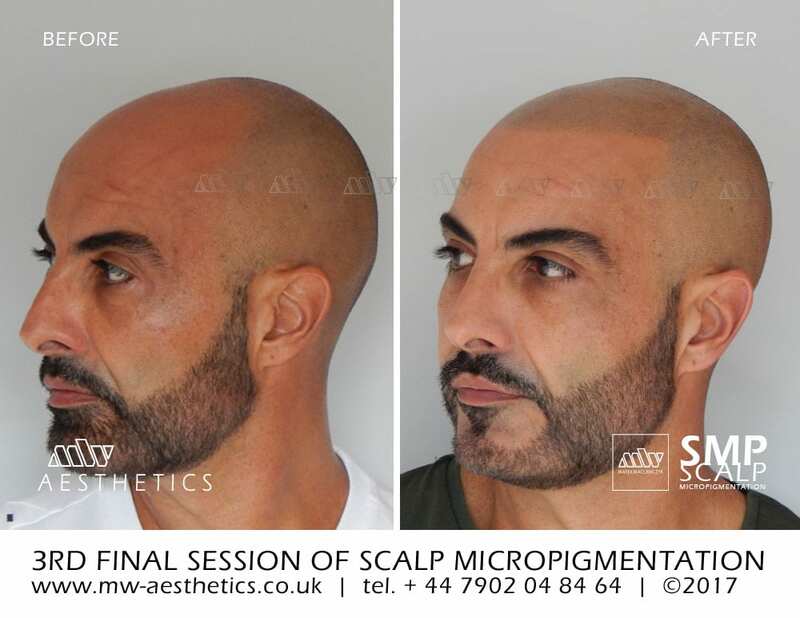 Why not talk to our practitioner yourself to find out more about scalp micropigmentation, and whether it’s right for you. Call us now for more in depth advice, or book an appointment to enjoy your own scalp micropigmentation experience. Trends in permanent eyebrows: The ombre technique Semi-permanent eyebrows: microblading or machine?